증권사는 자산운용사 등의 기관으로부터 대량의 주문을 수탁받아 집행하고 거래수수료를 받습니다. 증권사의 대량주문을 시장에서 한번에 집행하면 많은 마켓임팩트가 발생하여 적절한 가격에 거래하기 어려워지므로 이를 위해 딜러들이 주문을 나누어 집행하거나, 주문을 적절히 분할하여 집행해주는 알고트레이딩 시스템을 사용하고 있습니다. Brokerage firms receive brokerage fees based on the trading volume from the institutional investors. To minimize the market impacts caused by massive trading orders, brokers normally divide trading orders into pieces or utilize algorithm trading systems which automatically break orders in parts. 알고트레이딩 시스템은 대량의 주문을 효율적으로 분할하여 집행하기 위한 알고리즘을 탑재한 주문집행시스템입니다. 알고트레이딩은 TWAP, VWAP, MOC, POV, IS, Peg 등의 알고리즘을 탑재하고 있습니다. 이러한 알고리즘은 사전에 미리 입력된 것으로 새로운 시장데이터에 대한 적응성과 효율성이 떨어집니다. Algo-trading system is a trading execution solution which designed to increase the efficiency of trading when breaking large orders into pieces. 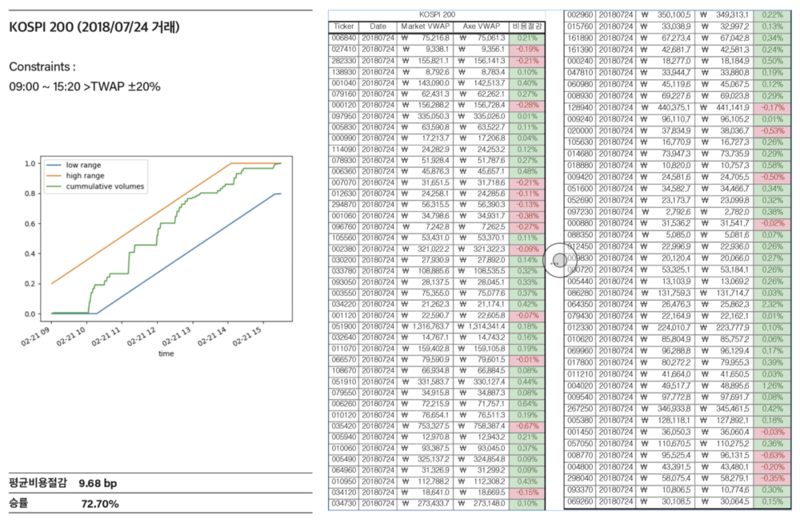 Algo-trading has algorithms such as TWAP, VWAP, MOC, POV, IS, Peg, etc. These algorithms are predetermined rule-based and, therefore, cannot adapt to the fast-changing market conditions instantly. AXE는 크래프트테크놀로지스의 딥러닝기반 주문집행시스템 브랜드입니다. AXE는 JP Morgan Chase 의 LOXM 시스템에 이어 세계에서 두번째로 개발된 딥러닝기반 인공지능 주문집행시스템입니다. AXE의 목적은 ① 주문에 의한 시장 충격을 최소화하고 ② 주문 비용을 절감하는 것입니다. AXE는 사전에 입력된 룰에 의해 주문을 분할하는 것이 아니라, Adversarial Soft-learning RL 알고리즘에 마켓 시뮬레이션 알고리즘이 결합된 엔진을 통해 시장 데이터를 지속적으로 학습하여 적절한 분할 전략을 발견하고 끊임없이 진화하도록 설계되어 있습니다. 그 결과 AXE는 기존의 알고트레이딩 시스템보다 성능이 우수하고 시장의 변화에 대한 적응력이 뛰어납니다. 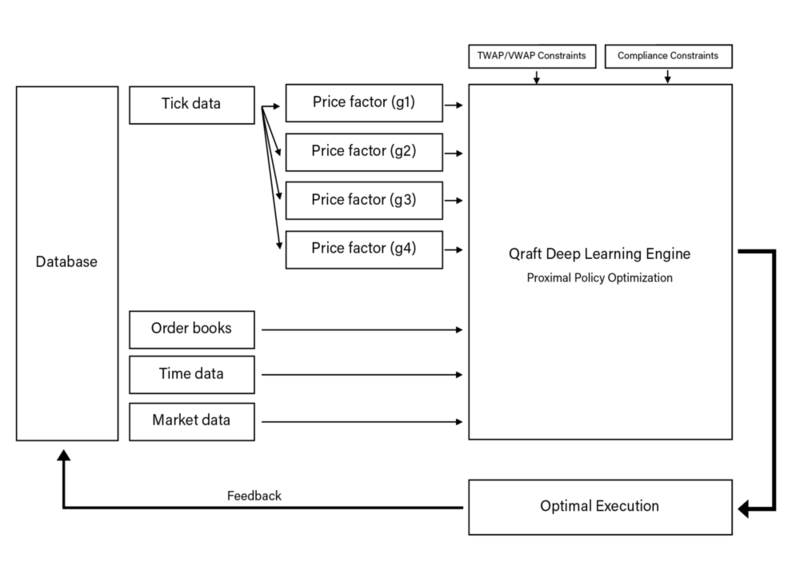 AXE is a deep-learning-based execution system developed by QraftTechnologies. 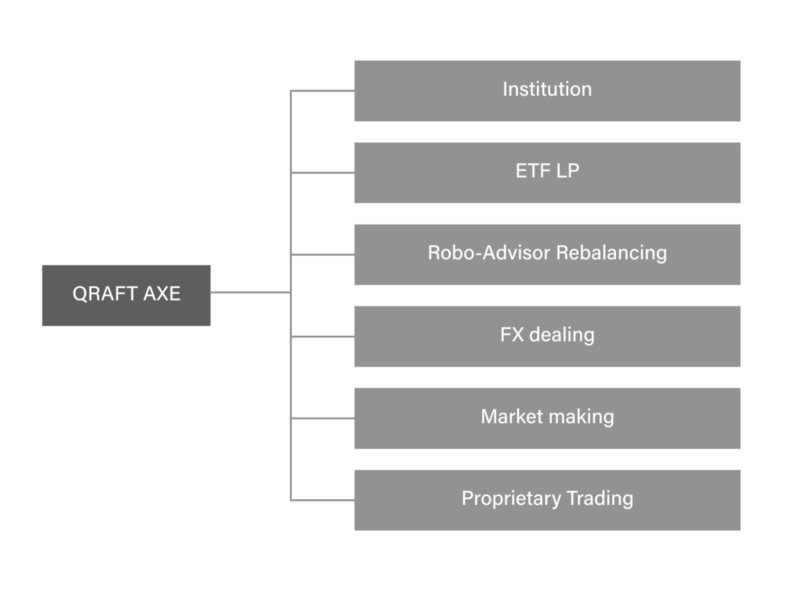 AXE is the second AI-driven trading execution system followed by JP Morgan’s LOXM. The purpose of AXE is to minimize the market impact of orders and reduce transaction costs. AXE is designed to discover the most efficient trading strategies and to learn and evolve with fast-changing market conditions rather than just following predetermined trading rules. 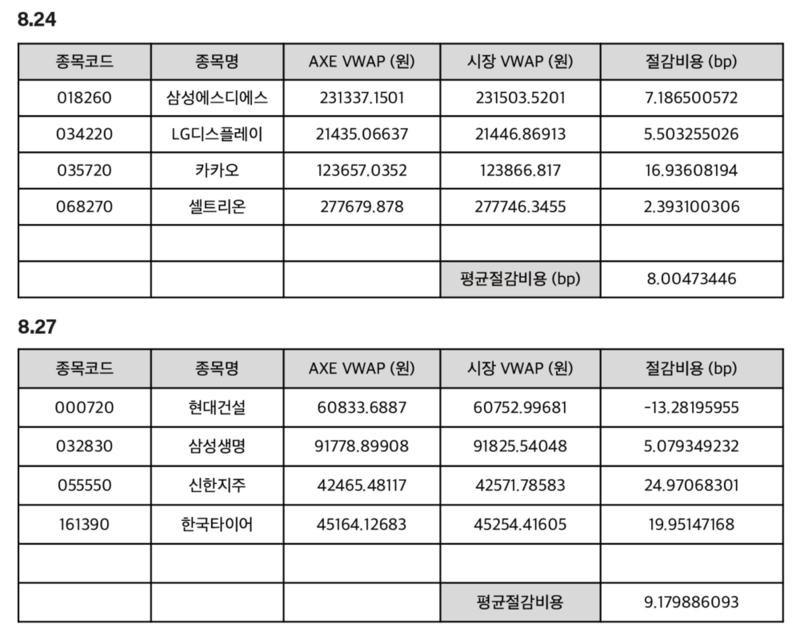 AXE was able to reduce 6 bps of transaction cost in terms of VWAP when it was applied in the actual market (Oct. 2018 / Trades for KOSPI200 Equities).